Gesturing from the civil rights era forward to the present, Burrell examines how the civil rights theatre movement has been (mis)remembered in “neo-civil rights dramas.” A number of recent plays revisiting Lorraine Hansberry’s A Raisin in the Sun—including Bruce Norris’s Clybourne Park (2010)—have established that one of the central ways we understand race relations in the United States is through civil rights theatre. 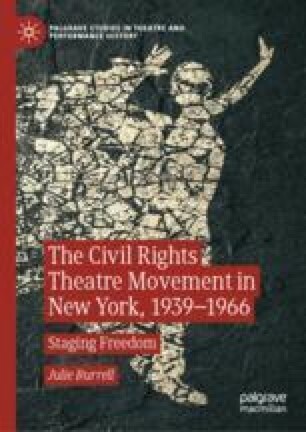 Yet, civil rights theatre has been caricatured through a consensus memory that casts a warm glow of good feeling on the icons and narratives of the movement, while obscuring ongoing racial inequality. “Neo-civil rights dramas” frequently abandon the more progressive visions of leftist playwrights who pioneered the drama of black freedom during the 1940s and 1950s.